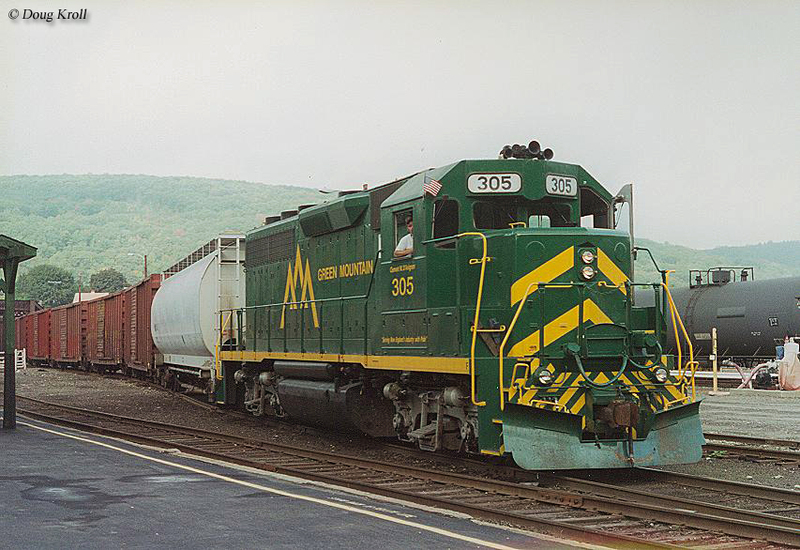 The Green Mountain Railroad (reporting marks, GMRC) is in many ways the resurrected Rutland Railroad, Vermont's fabled freight carrier until the early 1960s. Using a forest green and yellow livery inspired directly from the Rutland (it’s virtually identical) the Green Mountain has been operating since 1964 just a few years after the Rutland's demise when it was started by F. Nelson Blount to operate his collection of steam locomotives. While Mr. Blount passed away a few years after creating his new tourist railroad, which eventually became part of the National Park Service’s Steamtown, USA located in Scranton, Pennsylvania the Green Mountain Railroad lived on and split off as its own operation. Today, the railroad hauls both passengers and freight and has been widely acclaimed as the top tourist railroad in New England with its spectacular views of Green Mountain Range and onboard train services. The Green Mountain Railroad dates back to the Rutland Railroad. The Rutland has not been in operation since it shutdown in 1961 due to lack of freight traffic and labor disputes. However, in 1964 Mr. Blount stepped in to pick up some of the pieces of the Rutland, vying to operate the former railroad’s line between Rutland and Bellow Falls for his collection of Steamtown locomotives. After discussions with the State of Vermont and employees of the railroad it was decided to operate the entire route between Rutland and Ludlow for both freight and passenger operations. Had it not been for the efforts to save the former Rutland line all those years back in the mid-1960s the revered Vermont railroad, which is fondly remembered for its covered bridges and bucolic countryside scenes, would now quite likely be only a memory. Today, the Green Mountain has split off from the Steamtown, USA museum and is an independent operation under the Vermont Rail System; you can also still see freight trains operating the route which interchanges traffic with both Pan Am Railways and New England Central Railroad (at Bellows Falls). 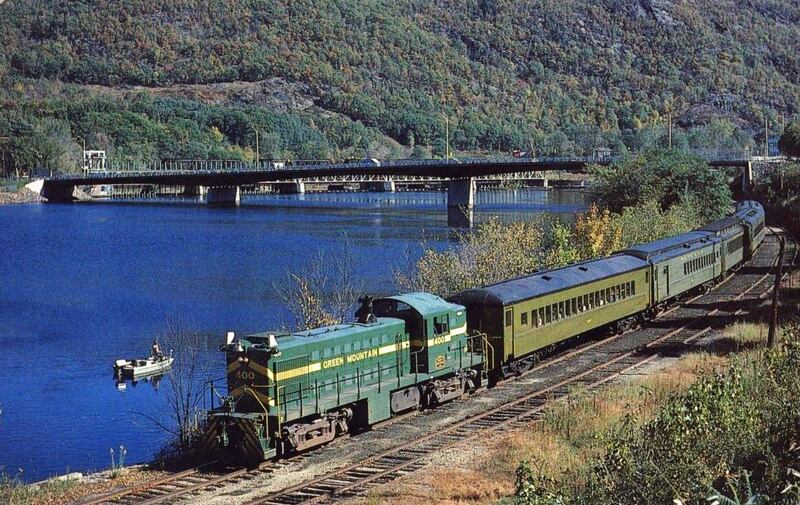 Currently the Green Mountain Railroad offers numerous excursions along its route including the Green Mountain Flyer, Champlain Valley Flyer, and White River Flyer. The railroad also operates numerous specials throughout the year, particularly during the holidays (which include the Easter Bunny Express in April, Mother’s Day Express in May, FarmWay Shopping Excursion in June, Murder Mystery Train in July, and several others). Most of the Green Mountain's trains depart either White River Junction or Thetford, also they also offer trips from Montshire. Usually the railroad employs their historic Alco RS-1 or S-4 locomotives to pull excursion trips, which are original Rutland units. Additionally, they use dated, heavyweight coaches for passengers to ride aboard during trips. If you are seriously interested in taking a ride on the railroad please be aware that they only operate a full schedule between July and October, as the rest of the year is hit and miss depending on when special events are taking place such as the during Easter. So, if you’re ever in Vermont vacationing or interested in riding one of the more scenic railroads in the country then a visit to the Green Mountain Railroad is definitely in order as I’m sure you won’t be disappointed in the experience. 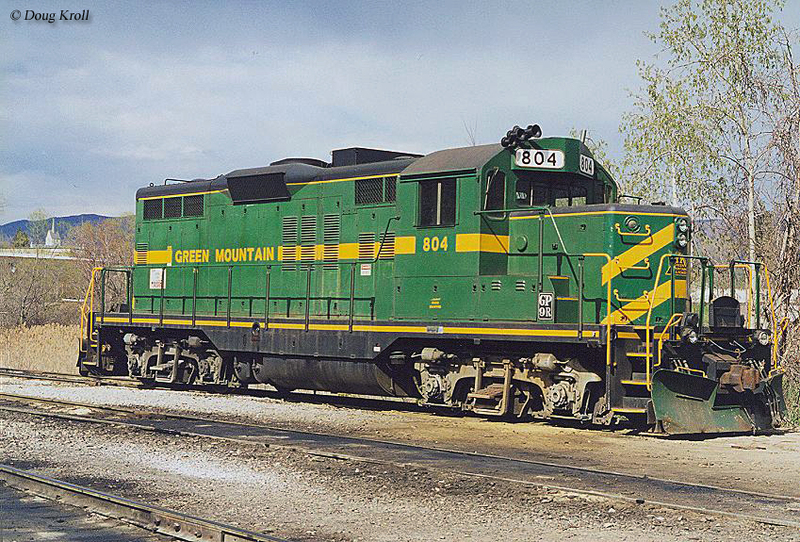 For more information about all of the excursions and services the Green Mountain Railroad has to offer please click here to visit their website. Their site includes everything you need to know if you are planning a visit to the railroad, such as a monthly calendar, pricing, directions to their various locations, all of their special events and trains they operate, and much more. Finally, for railfans or those interested in the locomotives the railroad operates please check out their roster listed below. 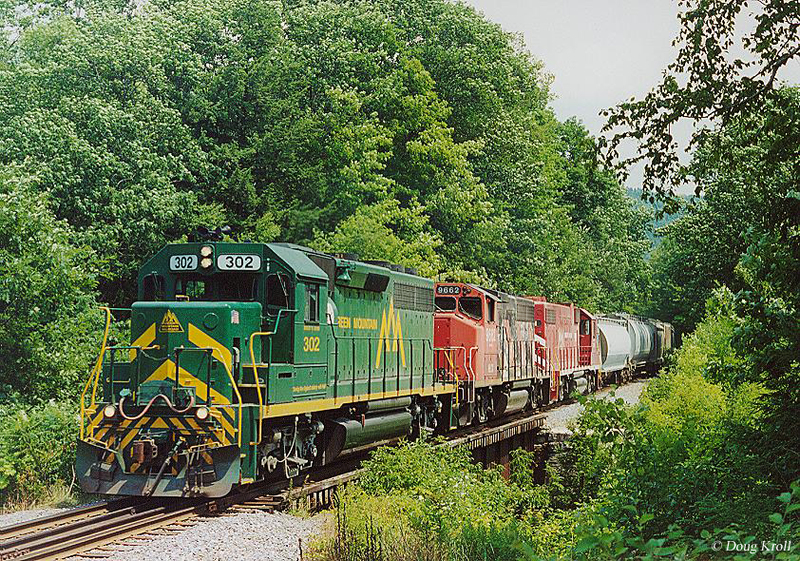 It should be noted that when the Green Mountain is not operating excursion trains its locomotives are typically pressed into freight service when needed. As such, it makes for an interesting scene with dark forest green and bright red locomotives working together pulling a freight train. For more reading on the Rutland Railway you might want to consider picking up a copy of the The Rutland Road by author Jim Shaughnessy. While it is hard to find resources out there detailing the Rutland Mr. Shaughnessy’s book is a fabulous compilation of information on the Rutland from its earliest beginnings to eventual shutdown in 1961. If you have any interest in the Rutland or would like to learn more about this fabled little Vermont railroad I would highly recommend Mr. Shaughnessy’s book. 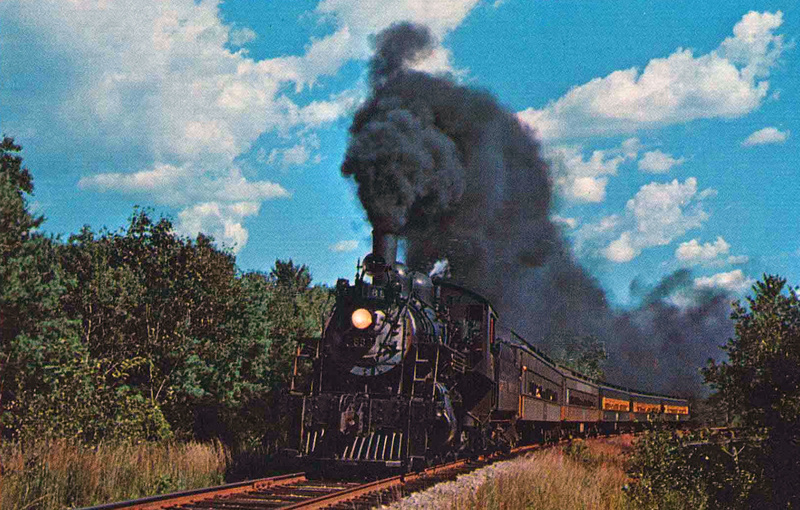 Also, for more information about excursion trains like the Durbin and Green Mountain Railroad you might want to consider the Tourist Trains Guidebook, which is put together by the editors of Kalmbach Publishing's Trains magazine.